Spring has finally arrived! The first signs of spring include the budding trees and flowers, birds, butterflies and the bees. It is easy to forget those busy little bees, the pollinators so important to crops, plants and trees. Some even regard the bee as a pest, scared of its sting. BUZZ, BUZZ. Here's an amazing bee book you must read! The charming Bee & Me children’s book by Elle J. McGuinness strives to set the facts straight and helps kids appreciate the humble bee through rhyming verse and moving pictures. 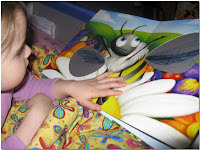 This fascinating bee book features an AniMotion™ Illustration Technique. Many of the illustrations magically move when you turn the pages. It is truly amazing to watch the bee fly. In the story, a bee busily pollinates flowers until a dog chases it into a little boy’s home. Afraid of the bee, the boy hides. The misunderstood little bee cries and tells the boy that he shouldn’t be scared; bees only want to help humans. 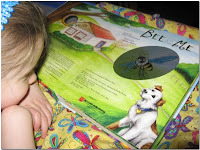 The final pages of the book list facts about bees and simple ways kids can help bees. Just how important is the bee? The honeybee is the official state insect in seventeen states, including Wisconsin. Bees help us grow one-third of all the food we consume. However, in recent years an alarming problem called colony collapse threatens the bee's survival. Bee & Me teachs kids the ecological and environmental importance of the honeybee and instructs children to respect the remarkable insect. Younger children will learn from and enjoy the short rhyming verses. Young and old like will have a hard time setting this unique moving picture book down with it's colorful, eye-catching illustrations by Heather Brown. Even my one-year-old watches with fascination and wonder as the pictures move. This New York Times children's bestseller book is definitely worth a trip to the bookstore! Win a copy! Andrews McMeel Publishing has kindly offered to give away one (1) copy of Bee & Me to a Brimful Curiosities reader. To enter, visit Andrews McMeel Publishing - Kids Products and leave a comment naming the title of another book for kids available on the website. I like the looks of the I Like Dogs book, how it's interactive! I tweeted the contest but I don't know how to give a direct link to the the tweet. My id is callista83 though. This sounds great! I'd love to read this! I think my kids would enjoy "Baby Turtle's Tale" and I would love to check out the drawing books! There are so many that I'll have to look into!! Yeah! I like the baby turtles book. It reminds me of the beach and summer fun. Oh how I would love this book for my 3 1/2 year old! Another title I saw on the site was...shoot, I already forgot - ha! Must still have preggo brain (I just had my third babe)! It's about a baby turtle...I'll have to go back to the site now and look again! What a great giveaway! My son would love the Eyeball Animations Dinosaur book. He loves to draw and loves dinosaurs. I like the book "Silly Dogs"
I subscribe via Google Reader and email! They have a cute book called "Crazy Cats". Please include me in your giveaway. I am a follower. Silly Dogs looks like an adorable book that my little one would love! Bee & Me looks like a delightful book and I would love to win this for myself as much as my little one! Thanks for the giveaway! One book that I really like is Baby Turtles Tale. The Big book of games looks like a lot of fun. Eyeball Animation Drawing Book: Dinosaur Edition is another kids book they offer. Silly Dogs is another book (which looks adorable). Thanks for the give away! I follow you on twitter and then I put a tweet about you! I like the book Silly Dogs! Thanks! I really like the book Eyeball Animation Drawing Book Dinosaur Edition. Thank you! Crazy Cats looks good! I know my grandson would like it. Baby Turtle's Tail is also available and looks like a cute book! I like the "Here's Looking At You-In Your Dreams" Book. http://www.andrewsmcmeel.com/products/?isbn=0740781073 It looks interesting with the mirror inside. What a cute book, I'd love to have my own copy to share with my class! My granddaughter woudl jut love reading this book. I also like the The Turtle's Tale and the Here's Looking at You: In Your Dreams books too. The Flip & Click Big Book of Games: 100 Games looks really fun! "Baby Turtle's Tale" looks fun also. Thanks for the contest! i'd love to win this book...i think the 'in your dreams' book looks neat too! "Silly Dogs," and "Crazy Cats" My kiddos would love them. The Bee & Me is fantastic, I have a little girl I would love to share it with, she is 8 and she is very interested in bees and bee keeping, she visited a lady who helped her learn a lot more as the lady is a bee keeper. She would love this book. The 'in your dreams' book looks sweet. Crazy Cats looks like fun. 'Baby Turtle's Tale' looks adorable! One choice is the Eyeball Animation Drawing Book: Dinosaur Edition. Silly Dogs looks like a fun book. Lacey O'Neal looks like a fabulous book my daughter would love. Thanks for a great giveaway! My daughter loves her "puppa" so I imagine she would like the I Like Dogs book. this one pls: "Silly Dogs"
Silly Dogs looks like a fun read! I like Frog in the Kitchen Sink! The Here's Looking at You: In Your Dreams book my daughter would love too. Alison the animal lover would like either Crazy Cats and Silly Dogs. I love the Baby Turtle's Tale as well. We love to go to Hawaii and I want to teach my daughter about the sea and creatures! Silly Dogs by Gandee Vasan looks like one we would enjoy! Thanks for the giveaway. I like Mass Historia-365 Days of Historical facts-a humour book for my older teen who is a history buff. I think SILLY DOGS looks like a winner. Thanks for the entry. Also, I follow. The Silly Dogs book is adorable! I like how it uses the sense of touch as well to keep the child involved. My son would like the Eyeball Animation DInosaur book! I like the baby turtles book. Our neighbors have turtles in the yard that they take care of and feed, my son and I love the turtles. I think "Here's looking at you: On the go" looks cute.